I’ve shopped long and hard trying to find the best option. From the ASUS G75 to the NextComputing Radius, it’s been quite the ride trying to find the ultimate broadcast system for Telestream Wirecast and a couple 1080p cameras. The G75 series from ASUS are powerful little notebooks with a reasonable price tag, however there are few models in the line which carry Thunderbolt, which would be required for reasonable 1080p performance from our cameras. No, we’re not risking USB 3.0 in the field. NextComputing’s Radius devices are pretty sleek from the perspective of power-to-portability ratio, and have the added benefit of being able to expand the internal components. For example, rather than needing to use Thunderbolt external capture devices for the cameras, we could just pop a few BlackMagic Intensity Pro PCIe cards in the chassis. The NextComputing Radius has a built-in monitor, which further improves the portability over say, taking our studio server on the road. After extensive research, the Radius looks like the best option for serious Wirecast users wanting to take their studio on the road. The price tag is pretty steep though, with some of the systems costing around the $6k mark. Keeping in mind that us PC users aren’t accustomed to paying that much for a computer (we’re not Mac users after-all) that’s a pretty steep price for a volunteer show with limited budget. 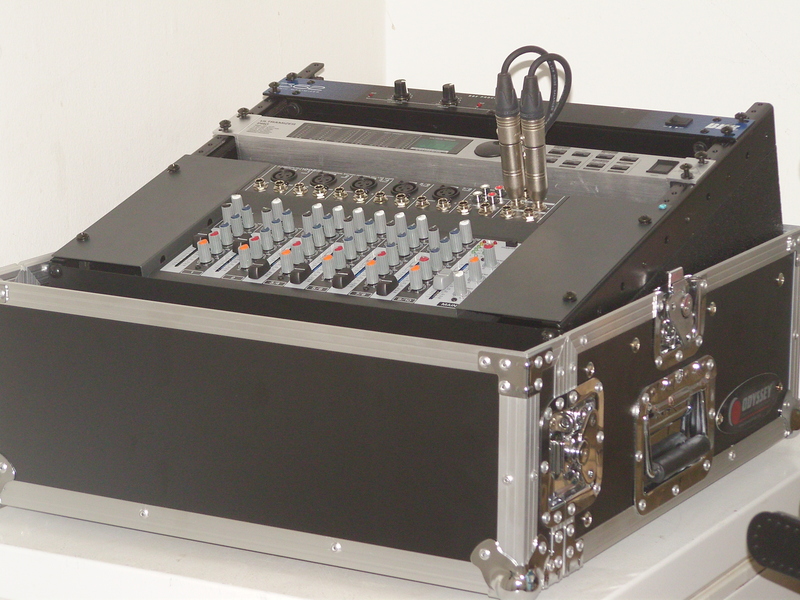 But, it’s the ultimate portable option for Wirecast and still much, much less than a TriCaster or something similar. The Radius would mean that even while on the road, we could have full HD, all from a very portable rig. No having to cart around a separate LCD, and it’s nicely protected by its case and a fitted carrying bag. It’s also solid state, so if bumped during transit, chances are it’ll last a lot better than moving our actual in-studio server (which is a bit of a nightmare to even consider). So, now I know from my research what would be the “best” option, but can I afford it at this time? Definitely not. Maybe one day. So for now, my quest changes course. I make do, planning well for the future, and making our existing gear as portable as possible to accommodate our upcoming shows. I purchased a 120GB Corsair SSD Force GT drive to further increase the performance on the main server, but ultimately to make it safer to transport. Moving the server with 4 spinning drives in it is not only risky, but heavy. I started moving the audio gear (2/3 Behringer, 1/3 BBE) into the new flight box, and it’s really roomy and feels GREAT. I’m very excited about the safe portability. I also grabbed a really great deal on a new flight box to allow safe transport of our audio gear, and we’re well on our way to having the ability to “move” the actual studio for remote broadcasts. It’s less than ideal because it’s a huge amount of work to have to re-wire everything each Tuesday following a remote broadcast, and the server and lighting we have in the studio is much larger than I’d want for a portable rig, but it’s cheap, and will get us through for now. I’ll save up ad revenue and set aside your donations, and we’ll see how it goes toward making the ultimate secondary portable studio (so we don’t have to tear down the real studio to do a remote show). Having the remote studio will inevitably mean we can do more on-location stuff on Category5, which I look forward to. Thanks for your support! Hope you love what’s to come from Category5 Technology TV. This entry was posted in Category5 Technology TV, Portable / Mobile Studio, Studio and tagged asus, hardware, nextcomputing, portable studio by Robbie Ferguson. Bookmark the permalink. Would Thunderbolt not drain on resources as much or more then USB3? I was under the impression alot of motherboard and laptop manufacturers found ways to buffer or otherwise offset the USB issue. No, I wouldn’t think so, since Thunderbolt is a next-gen PCI-Express essentially… whereas USB 3.0 is … well, USB, which draws its power from the CPU (which is what we DON’T want in a production environment). Thunderbolt would be more independent of the CPU than USB 3.0, which means if you hook up 3 cameras, you’re not using 3x the CPU (as would be the case with USB).